Brenda Levy Hutchings obituary. Carnes Funeral Home. Brenda Levy Hutchings left this earth to join her Lord and her beloved husband, John, on January 31st, 2018. A Memorial Service will be held at Carnes Funeral Home, Texas City, Texas on Monday, February 5th, 2018 at 11:00 AM with Rabbi Kessler officiating. Brenda was born in Galveston on May 24, 1940 to Julian and Billie Levy. She was the granddaughter of the late Mr. and Mrs. Harry Herbert Levy, Sr. and the great granddaughter of the late Max and Sarah Maas. Jacques Offenbach, composer of the operetta “The Tales of Hoffman” and the “Can-Can”, was her great-great grand uncle. She graduated from Ball High School and attended Hollins College in Roanoke, Virginia before returning home to marry her prince charming, John Henry Hutchings, in 1960. They were married for 40 years, before he passed away in 2000. At the time of her death, Brenda was a member of the Board of Directors of The Grand 1894 Opera House, and a trustee of both the Robert K. and Marie B. Hutchings Foundation and the George Ball Charity Association. She had previously served on the boards of directors of the American Heart Association Galveston Division, Hospice Care Team, Salvation Army and the Junior League of Galveston County, Inc. She was First Directress of the Board of Lady Managers of the Galveston Orphans Home, and she was one of only two women ever to serve on that organization’s Board of Trustees. 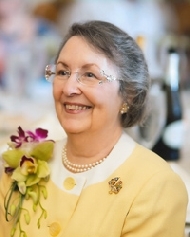 She and her husband were instrumental in the formation of The Children’s Center, where she also served as Executive Director and as a member of the Board of Directors. Brenda was preceded in death by John, her beloved husband; her parents Julian and Billie Levy; and her sister, Pamela Levy Sanderson. She is also predeceased by her mother- and father-in-law, Marie and Robert K. Hutchings. She is survived by her son John Henry Hutchings, Jr. and wife, Andrea of LaPorte; her daughter, Julie Hutchings Bennett and husband, Ron of Pearland; and her loved and adored grandchildren, Samantha Taylor Bennett and John Henry Hutchings Bennett. She is also survived by her brother Julian A. Levy Jr. of Columbia Maryland; niece Alexis (Lexi) Levy Milani and husband, Matthew of Catonsville, Maryland; niece Anna Levy Huckleberry and husband, Michael J., of Ft. Bragg, California; and nephew Samuel Wade Levy (Sam) and wife, Harmony Stempel of Brooklyn, New York and great nephew Avery Milani of Catonsville, Maryland. In addition, she is survived by step-grandchildren, Valerie Brinkerhoff Hendrickson and husband, Jason of League City, and Candice Brinkerhoff, as well as six step-great-grandchildren- Tyler, Chase and Kaylee Hendrickson, Felicity Anderson, and Arianna and Xavier Marquez. Pallbearers will be William “Bill” Ansell, Michael C. Doherty, Thomas E. Farmer, Jr., David O’Donohoe, Michael A. Piel and James C. Grant, MD. Honorary Pallbearers are John L. O’Sullivan, Benny Holland and James L. Ware. Donations may be made to The Grand 1894 Opera House, to the John Henry Hutchings Memorial Fund at UTMB or to the charity of one’s choice.